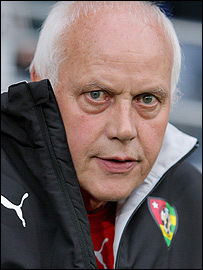 Confusion surrounds the possible return of Otto Pfister as Togo coach. The 68-year-old resigned on Friday following a pay dispute between players and the Togo football federation. He then said he would return for Togo's World Cup opener against South Korea on Tuesday, after receiving a fax offering him his job back. But a government official said Pfister would not be reappointed, and a Togo football administrator said assistant Kodjovi Mawuena would step in. Mawuena was one of Pfister's assistants before he quit after a row over unpaid bonuses. Pfister's son and agent, Mike, told fifaworldcup.com that an agreement had been reached to enable his father to resume his duties. "Yes, he is back as a Togo coach," said Pfister Jr. "It is a matter of the heart. "The FA has decided to choose him against all other candidates. "The players have also tried to get him back over the last days and contacted him, which was the decisive step." 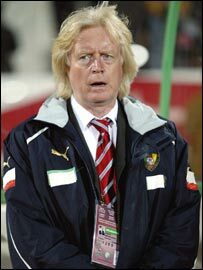 It leaves Togo's preparations shrouded in confusion, not least because former Cameroon coach Winfried Schaefer has been approached to replace Pfister. Schaefer held a four-hour meeting with Togo officials on Sunday after Pfister's shock resignation. However, he was not confident that he would be handed the job after making a series of demands in line with those that Pfister had made. Players have pressed their demands for 155,000 euros (£105,900) each to play in the World Cup plus 30,000 euros (£20,500) each per win and 15,000 euros (£10,000) per draw. Officials from a country with an average per-capita income well below £500 have said the demands are too high and negotiations are still underway. What would your combined African Nations team look like? "I don't think there will be an agreement," said Schaefer, before Pfister announced he would take charge of the Group G opener. Togo, the lowest Fifa-ranked team in the tournament, are appearing in the World Cup finals for the first time. Their other Group G opponents are France and Switzerland.